SWPBS stands for School Wide Positive Behaviour Support. It is a broad range of systemic and individualised strategies for achieving social and learning outcomes in schools whilst also working to prevent problem behaviours. SWPBS is our school’s framework for building and maintaining a safe, supportive and inclusive school environment, ensuring that students are engaged, motivated and focussed on their learning at every opportunity. At Willow Grove Primary School, we are proud to be a School Wide Positive Behaviour Support School and model and explicitly teach our values through the School Wide Positive Behaviour Program. This means that we explicitly teach, promote and acknowledge the use of our values of Respect, Resilience, Teamwork and Community. These four values represent the character of our school, the expectations we have of all members of our school community and were chosen as the values our community wanted to instil in all of our students. 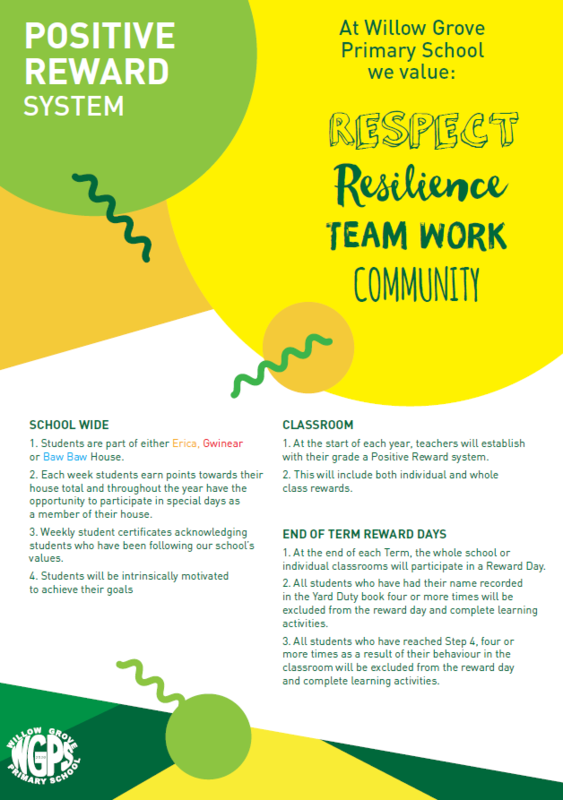 Our staff incorporate these values and expected behaviours into our daily teaching and learning program, as well as weekly as part of structured lessons. Being a SWPBS school allows our staff, students and parents to name, acknowledge and teach positive and productive behaviours. An example of teaching our expected behaviours has been through our continued and sustained focus on teaching Resilience and what it means to be resilient and have a growth mindset (as opposed to a fixed mindset). We can even think about our values and what it means to be a School Wide Positive Behaviour Support school through the lens of a growth mindset or a fixed mindset. All of our staff believe that by making the expectations of behaviour clear and explicitly teaching those expected behaviours, all students have the ability to consistently demonstrate our values through their daily interactions with each other. 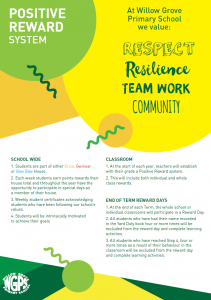 They will be able to learn how to be respectful, resilient, demonstrate teamwork and contribute positively to their school & broader community. Students’ behaviour is fixed. You are either born ‘naughty’ or ‘nice.’ Your talents, abilities and behaviour is set in stone. “If a child doesn’t know how to behave, we teach? … we punish? Finishing the last sentence does not come as automatically as it does the others (of which there could be hundreds of different contexts used). Unless you view children’s behaviour through the lens of a School Wide Positive Behaviour Support school, and then it does. A matrix has been developed by students and staff to identify the expected behaviours at Willow Grove Primary School. The matrix includes the specific behaviours expected by students for each value in different settings across the school. These behaviours are displayed in the school, taught to students, acknowledged through “Golden Tickets,” at assembly, in the newsletter and discussed and referred to on a daily basis. 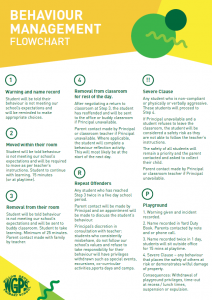 The following documents, detail our consistent whole school approach to Behaviour Management and our Positive Acknowledgment System. 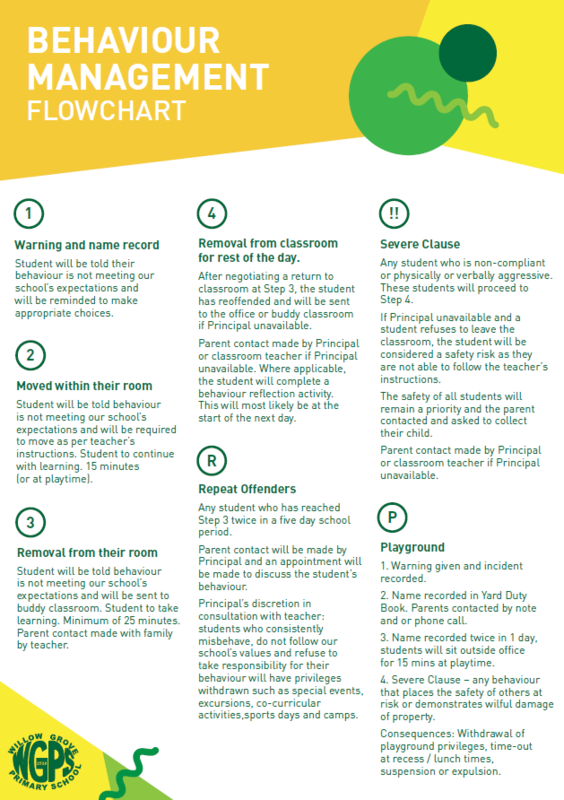 For more information, please refer to our Behaviour Management Policy.